On Saturday, September 29, Arlington Young Democrats gathered at the Ballston metro to divide among a few cars to drive to Williamsburg. My car listened to hits of the 1990s and 2000s, which is a perk of canvassing with people who grew up with the same music. Once in Williamsburg, we canvassed for Elaine Luria, a progressive candidate, Navy veteran, and small business owner, who is running for US Congress in the Virginia 2 nd district. The campaign headquarters fed us hamburgers and hotdogs and delivered a pump-up speech, and then we were on our way. Knocking doors for just a few hours entails a wide range of experiences. Apartments are especially easy to canvas because they are close together. We met several enthusiastic Democrats, which is always encouraging. Few canvassing trips are complete without getting mildly lost once, which is why walking in pairs is important. Even better is when you befriend your canvassing partner, so you can chat between doors. At the end, we delivered sheets full of checked boxes indicating constituent responses to the regional field organizer. Canvassing is a fitting act of citizenship. Each person knocks fewer than a hundred doors, but altogether we reach thousands. Just showing up might be the hardest part, but then the endeavor is well-organized and social. You can end up walking miles without realizing it. 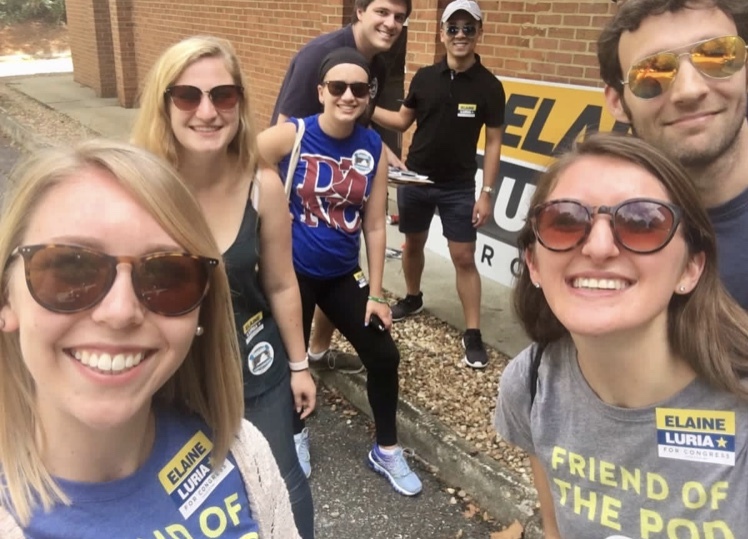 If Elaine Luria becomes the next Congresswoman representing Williamsburg, Arlington Young Democrats will know that we knocked doors, checked boxes, and walked miles to contribute.